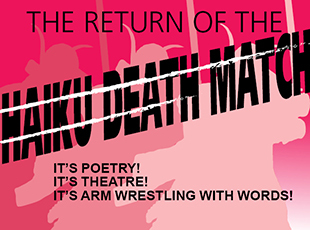 Heights Arts marks National Poetry Month with the presentation of its sixth Haiku Death Match at the Ensemble Theatre on Saturday, April 21. 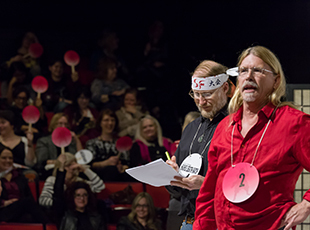 This “fun”raiser for literary arts programming will pit eight of the region’s best and bravest writers of the ancient Japanese 17-syllable form against each other in a fierce competition for audience approval. Pairs of poets read their original Haiku aloud, and the audience votes for the poem they like best. Low-scoring contestants are eliminated, and the last poet standing is declared Haiku Death Match Master. Last year’s winner and the current Haiku Master is well-known local poet Ray McNeice and he will again compete to defend his title against all comers, some of whom are coming from as far away as Toledo. The Haiku Death Match is held in April to celebrate National Poetry Month, and to raise funds for Heights Arts’ literary activities. Last year’s Death Match was sold out! DAY OF EVENT: Haiku Death Match tickets will also be available for purchase at the door, however, we encourage you to purchase on-line as the event sells out and we don’t want you to miss this great event! Are you rooting for a Haiku Warrior? For just $25.00, you can place a personal ad here to cheer him or her on, and support Heights Arts Literary programming in the process! Who will be the next Haiku Master? The eight poets in the ring will have to fight hard for the trophy. In the first half of the Death Match, poets will read their contemporary Haiku on the subjects: personal relationships, politics, animals in our life, the daily grind, and all things Cleveland. The four poets with the highest scores advance to the semi-finals, in which they will read only classical, nature-oriented Haiku. The two highest scorers from this round then battle to the ‘death’ with the audience deciding the 2018 Haiku Death Match Master.